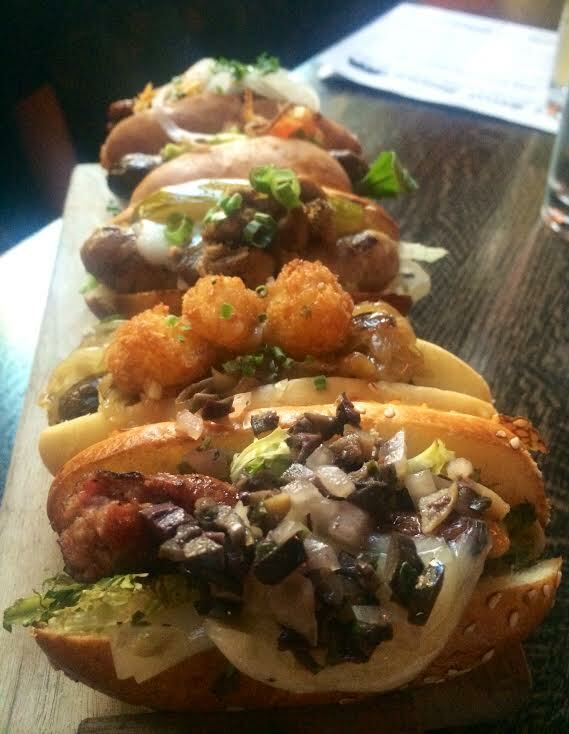 Remember that time I was invited to a restaurant to sample gourmet mini hot dogs? If your memory is as bad as mine (or you’re new to Bytes), let me provide you with a refresher. 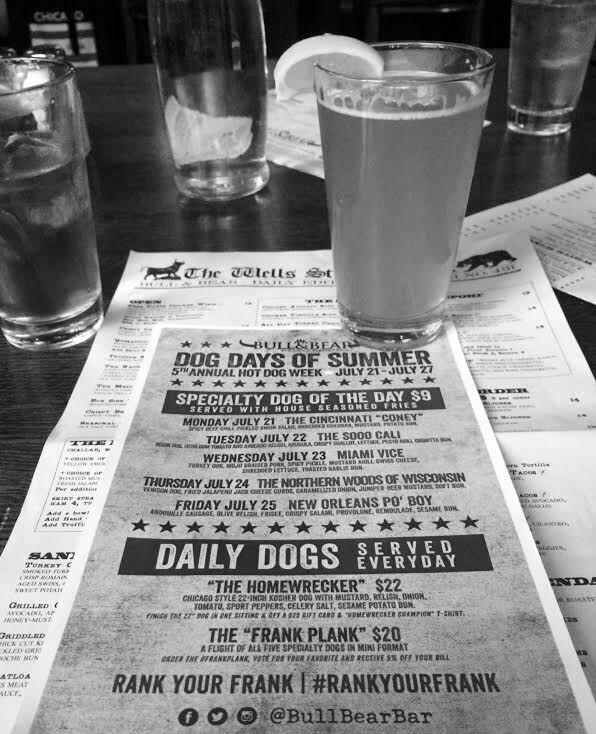 It was about a year ago when my cousin and I stopped by Bull & Bear for mini dogs, massive beers and mighty fine sweet potato fries. We had a dog gone good time and I wrote about it here. So, as National Hot Dog Week 2014 quickly approached, I was pleasantly surprised to be invited back to sample this year’s mini dogs. I brought along my foodie partner-in-crime, my boyfriend Greg (Hi Greg!) 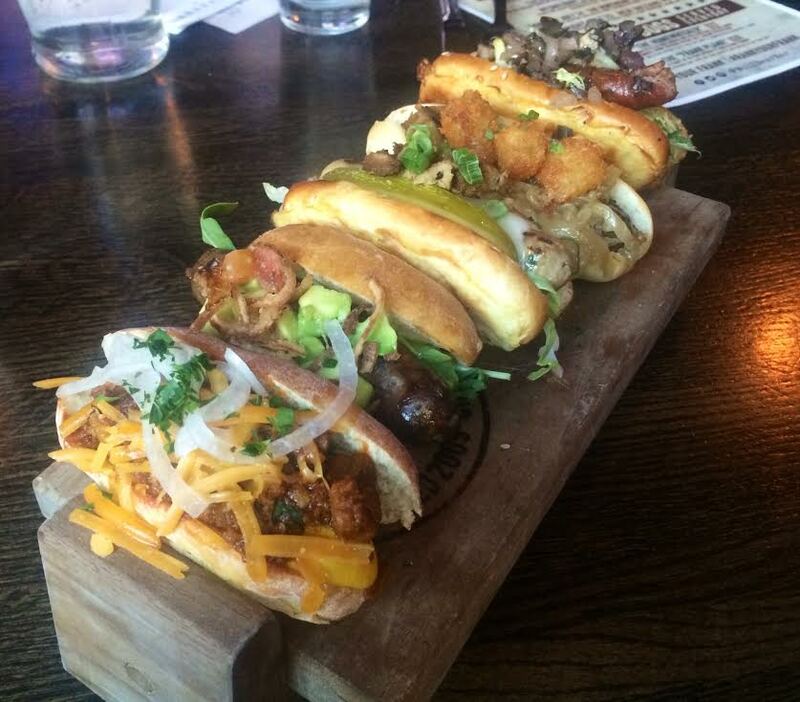 because if you can’t love a plate of fancy hot dogs together, what can you love? Last year’s “theme” was different neighborhoods in Chicago (Pilsen dog, Little Italy dog, Uptown dog, etc) and this year was all about different cities in the U.S. (NOLA dog, Cincinatti dog, Wisconsin dog, etc). Last year, my favorite was the Little Italy – a salami pepperoncini sausage with aged provolone and arugula pesto. But what about this year? What dog would remain victorious?! We figured a sampling of all would be the best bet. 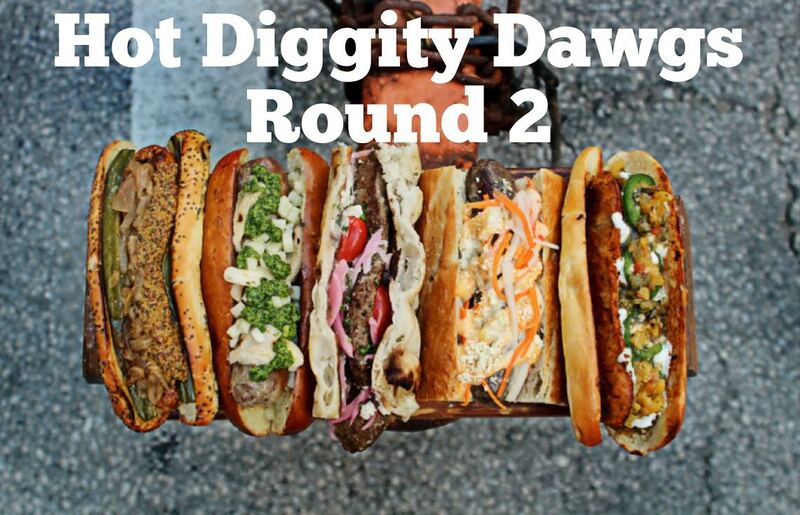 From left: Cincinatti “Coney” (beef chili, pickled onion salad, shredded cheddar, mustard), “Sooooo Cali” (bison dog, heirloom tomato & avocado relish, arugula, crispy shallot, lettuce, pesto aioli, ciabatta bun), Miami Vice (turkey dog, mojo braised pork, spicy pickle, mustard aioli, swiss cheese, shredded lettuce, toasted garlic bun), The Northern Woods of Wisconsin (venison dog, fried jalapeno jack cheese curds, caramelized onion, juniper-beer mustard) and New Orleans Po’ Boy (andouille sausage, olive relish, frisee, crispy salami, provolone, remoulade, sesame bun). It only took one bite for me to pick a favorite. That’s just how my taste buds work! Love at first sight? More like love at first byte. You wonder why picky eaters are so picky? They’re just waiting for the perfect bite, my friends. I will definitely admit it though, I was surprised at my pick. I’m usually a traditional gal when it comes to hot dogs. I’m talking Chicago style all the way. Mustard. Onions. Relish. Pickles. Sesame bun. Not a drop of stinkin’ ketchup in sight. However, when my eyes spotted “caramelized onions” on the menu, I knew that was it for me. No going back now. Venison dog, you had my heart before you even arrived. This dog not only had caramelized onions (seriously, I eat them on everything) but was topped with individual jalapeño cheese curds because…why not? Sure, the venison might’ve thrown me off at first, but my first bite was bursting with so much flavor, heat and sweet caramelized onion goodness that I immediately regretted the fact that we only had a mini. My runner-up dog was the Cincinatti “Coney” because as a chili addict (even in the sweltering hot summer), I know for a fact that not many things pair better than hot dogs and chili. At least when they’re in mini form and come alongside pickled onions. Yep, picked and caramelized. Love ’em both. The only dog I wasn’t most fond of was the Miami Vice, but if you’ll read my recap of last year’s, you’ll know I’m not crazy fond of too much spice. Other than that, I can’t complain at all about hot dog date night. Service was spot-on – the manager stopped by to chat and encouraged us to tweet & share our photos, water glasses were continuously filled and the crispy brussels sprouts salad dusted with parmesan and served with a lemon-caper aioli was AMAZING. I can’t thank you enough, Bull & Bear, for another fantastic evening. We’ll most certainly be back soon! I would like one of each, k, thx. Add to MT&Bytes Chi Food Tour 2014!?! Yes, yes, yes! Cannot wait for this! !